Those of us with long audio memories might recall Audio Alchemy. Back in the mid nineties, Audio Alchemy was the main protagonist in providing no-nonsense, low-cost DACs in basic boxes. At a time when DACs were relatively rare – and many of those on the market back then cost five figures – Audio Alchemy set out its store as the Loyal Opposition, providing upgradable high-performance audio at low cost. Fast forward to the mid teens and Audio Alchemy is back, still providing upgradable, high-performance audio at low cost. OK, so in the intervening years, the build got a lot better and the price rose accordingly, but they are still giant killing products at prices that don’t leave your wallet gasping for air. The range is small, but growing. It comprises a combination DAC, line preamplifier, and headphone amplifier (the DDP-1) with its optional power supply (the PS-5) and a stereo power amplifier (the DPA-1). There is also a mono version of the power amp – called, perhaps unsurprisingly, the DPA‑1M – and a new PPA-1 MM/MC phono stage, which can also be driven from one of two outputs on the PS-5. We tested the DDP-1, PS-5, and stereo DPA-1. Both preamp/DAC and phono stage come supplied with 9v in-line (wall-wart) power supplies, which should be removed when upgrading to the PS-5, and both products can be driven by the same PS-5. In short, you could get the full five box stack (phono stage, pre/DAC, power supply, and mono amps) and still have something small and light enough to carry. In the gravitationally-challenged world of high-end audio, that’s almost enough to seal the deal. It’s odd that in every other walk of consumer electronics, things shrink over time. Granted TV screens are getting larger by the year, but the technology itself is now thinner and lighter (and cheaper) than ever. Cameras, phones, games consoles, tablets, laptops, and the rest have all shrunk in size and weight – and often price – while improving performance. The same can happen in audio electronics, too, were it not for the massive amount of inertia built into many aspects of the audio world. We still seem to measure the quality of an amplifier by its size, weight, and price – “if it doesn’t have an inch-thick front panel and a transformer the size of a crash helmet, it’s not high-end!” Audio Alchemy has long since ‘politely’ disagreed with this inverted sizism, and lets its products speak for themselves in sound quality terms. As someone who occasionally lives on a diet of painkillers and NSAIDs after trying to lift one too many power amplifiers that weigh as much as a car engine, the idea of high-end electronics you can carry under your arm without dislocating your shoulder in the process is deeply attractive. 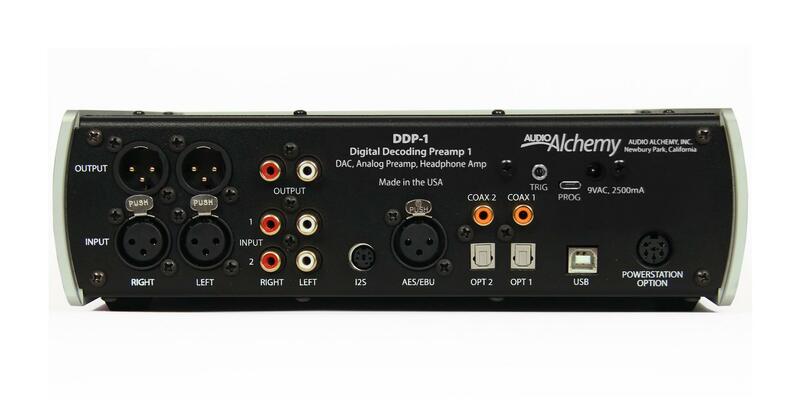 The DDP-1 (short for Digital Decoding Preamp) combines a DSD-ready XMOS digital signal processing chipset (fed from a large selection of digital inputs, including I2S and AES/EBU), a small two RCA, one XLR line stage, RCA and XLR outputs for a power amp, and a good, solid 3.5mm headphone jack socket. It’s designed to be easy to operate, with a combination of front panel controls and display, coupled with a remote control. It’s also designed to be very ‘now’ without being so future proofed it forgot the past: there is presently no CD player in the Audio Alchemy line-up (that’s a clue for future products), but if you own one with a digital output of any description, you will get the two to talk to one another. There is no provision for streaming, however; computer audio is dealt with through USB. The XMOS chipset, the DSP, the FGPA, and the microcontroller, however, are all inherently upgradable and should a new format that runs along USB or other lines necessitate a firmware upgrade, it’s easy to do.